MINNEAPOLIS -- The Minnesota Vikings, after watching their late-third-quarter 17-point lead vanish at the hands of the indefatigable Drew Brees, went back in front of the New Orleans Saints on a field goal with 1:29 left. The problem was they left just enough space for Case Keenum and the Vikings to answer with one of the NFL's all-time last-play stunners. 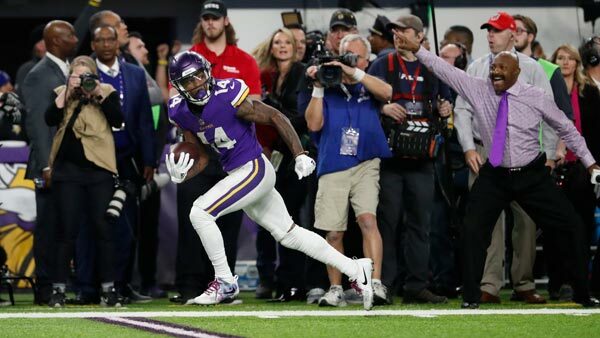 Keenum completed his last-ditch heave near the sideline Sunday on the game's final play to Stefon Diggs, who slithered away from the Saints for a 61-yard touchdown to give the Vikings a 29-24 victory and a spot in the NFC championship game at Philadelphia. "I don't know what the percentage was," Keenum said, "but just try to give the guy a chance." The play the Vikings ran, believe it or not, is called "Seven Heaven." Kyle Rudolph, Jarius Wright and Diggs all ran sideline routes from the right of the formation, with Diggs the deepest with his break coming at about 25 yards. This wasn't quite as improbable of a play as Franco Harris on the Immaculate Reception for the Pittsburgh Steelers in the 1972 playoffs , which was also in the divisional round, but these Vikings are on some kind of special path. "I had a pretty good view of it," Rudolph said. "I couldn't believe it. Things just don't work out that way." "It's a turning point for everybody," Diggs said. "The majority of people doubt us. They don't think it's going to happen, especially because of history. People have a way of saying history repeats itself. I guess this is not one of those cases." Now the Vikings can become the first team to play in a Super Bowl on their home turf, if they beat the Eagles. Instead of the usual win-or-go-home stakes, they're in a win-and-go-home situation. "It would've been nice to be home, but I feel like if we take care of business the way we're supposed to we'll have another chance to see our fans," Diggs said.